Imipramine (also known as melipramine) is an anti-depressant medication. It constitutes a class of drug known as tricyclic depressants (or TCAs). Imipramine Overdose is the accidental or intentional intake of the drug in dosage higher than the prescribed values. What are the Causes of Imipramine Overdose? It is sold as Antideprin, Janimine, Tipramine, Tofranil and Berkomine among others. What are the Signs and Symptoms of Imipramine Overdose? The signs and symptoms of Imipramine Overdose can vary from one individual to another. It may be mild in some and severe in others. Several systems of the body, such as the digestive system, nervous system, vascular system, respiratory system, skin and ENT may be affected. How is First Aid administered for Imipramine Overdose? Who should administer First Aid for Imipramine Overdose? 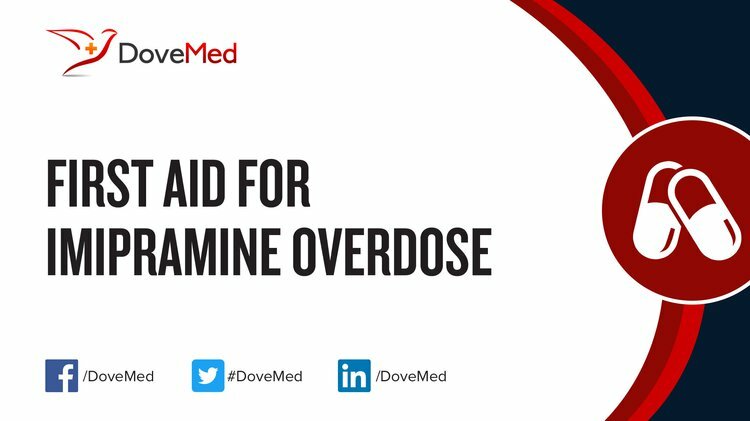 First aid for Imipramine Overdose is administered by healthcare professionals. What is the Prognosis of Imipramine Overdose? How can Imipramine Overdose be Prevented? Boegevig, S., Rothe, A., Tfelt-Hansen, J., & Hoegberg, L. C. (2011). Successful reversal of life threatening cardiac effect following dosulepin overdose using intravenous lipid emulsion. Clinical toxicology, 49(4), 337-339. Yates, C., Galvao, T., Sowinski, K. M., Mardini, K., Botnaru, T., Gosselin, S., ... & Ghannoum, M. (2014, July). Extracorporeal treatment for tricyclic antidepressant poisoning: recommendations from the EXTRIP Workgroup. In Seminars in dialysis (Vol. 27, No. 4, pp. 381-389). Agarwala, R., Ahmed, S. Z., & Wiegand, T. J. (2014). Prolonged use of intravenous lipid emulsion in a severe tricyclic antidepressant overdose. Journal of Medical Toxicology, 10(2), 210. Hellig, J., Von Watzdorf, I., Lahri, S., Vallabh, K., & Allgaier, R. L. (2012). Chewing the fat: A case report on intravenous lipid emulsion to reverse cardiotoxicity from intentional amitriptyline overdose. African Journal of Emergency Medicine, 2(4), 159-162. Doherty, S., Cave, G., & Harvey, M. (2012). Paediatric amitriptyline overdose. Open Journal of Pediatrics, 2(02), 170.
van den Berg, M. J. W., & Bosch, F. H. (2016). Case report: hemodynamic instability following severe metoprolol and imipramine intoxication successfully treated with intravenous fat emulsion. American journal of therapeutics, 23(1), e246-e248. Judge, B. S., & Rentmeester, L. L. (2013). Antidepressant overdose–induced seizures. Psychiatric Clinics of North America, 36(2), 245-260. Tse, C. W., Chan, Y. C., & Lau, F. L. (2015). Intravenous lipid emulsion as antidote: experience in Hong Kong. Hong Kong Journal of Emergency Medicine, 22(2), 100.